The brain’s neural network is a complex electric circuit of interconnected neurons – there are about 80 billion neurons in just one brain. A defect in the circuitry leads to neurodegenerative diseases, such as Alzheimer’s disease and Parkinson’s disease. Controlling neurons remotely might be a way of treating the millions of people who suffer from neurodegenerative diseases. The National Science Foundation (NSF) has awarded FIU $450,000 to research wirelessly controlled nanotransducers that repair the neural circuitry in the brain. The cross-disciplinary research is led by Sakhrat Khizroev, a professor at the College of Engineering & Computing with a joint appointment at the Herbert Wertheim College of Medicine, whose team invented the nanotransducers. In 2015, Khizroev and his team landed on Discover magazine’s top 100 science stories for their nanotechnology research, earning them the no. 48 spot on the list. “Our researchers are on the front lines of innovation. This Worlds Ahead research merges engineering and medicine and has the potential to revolutionize the way these devastating diseases are treated,” said John L. Volakis, dean of the College of Engineering & Computing. Alzheimer’s and Parkinson’s are the most common types of neurodegenerative diseases. According to the National Institute of Environmental Health Sciences (NIEHS), part of the National Institutes of Health (NIH), more than five million Americans live with Alzheimer’s and at least 500,000 have Parkinson’s. Khizorev’s research involves the intravenous injection of nanotransducers. 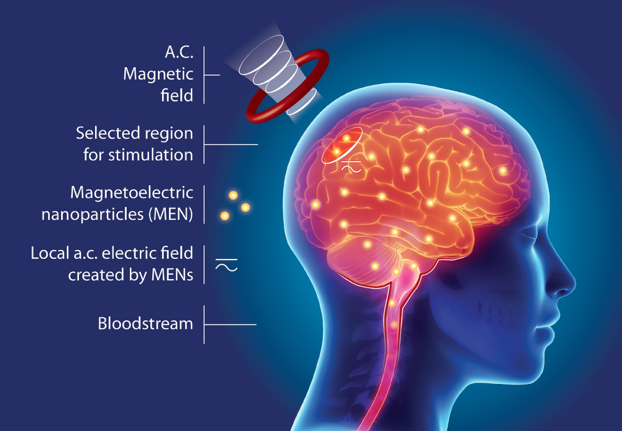 Special electromagnets near the head are then used to pull the nanoparticles to the brain, across the blood-brain barrier – a natural filter that allows very few substances, including most medicines, from reaching the brain. The next step is to apply a sequence of magnetic fields to induce electric stimulation of the neurons in the targeted location. The novel technology is similar to the approaches used in traditional deep-brain stimulation (DBS), a surgical intervention. Like traditional DBS, the “broken” part of the brain circuitry is repaired through electric field pulses and the treatment could be applied to neurological disorders which cannot be treated with drugs, including major depression and essential tremor. However, unlike DBS, the new technology is wirelessly controlled and does not require invasive surgery. “This approach doesn’t require the use of any drugs and, as such, it is fundamentally less prone to causing side effects,” said Khizroev, a professor in the Department of Electrical and Computer Engineering. Khizroev said that it could take two to five years for the technology to be tested on humans. In addition to repairing damage to the brain caused by neurodegenerative diseases, Khizroev expects the study also could shed light on the fundamental operation of the brain. That could eventually lead to the creation of precision medicine to treat the deadliest diseases. The project also includes researchers from Stark Neuroscience Research Institute at Indiana University and Neuroscience Centers of Florida Foundation (NSCFF).